I am officially in the holiday mood. Fall is my favorite time of year. I love the months of September, October and November. 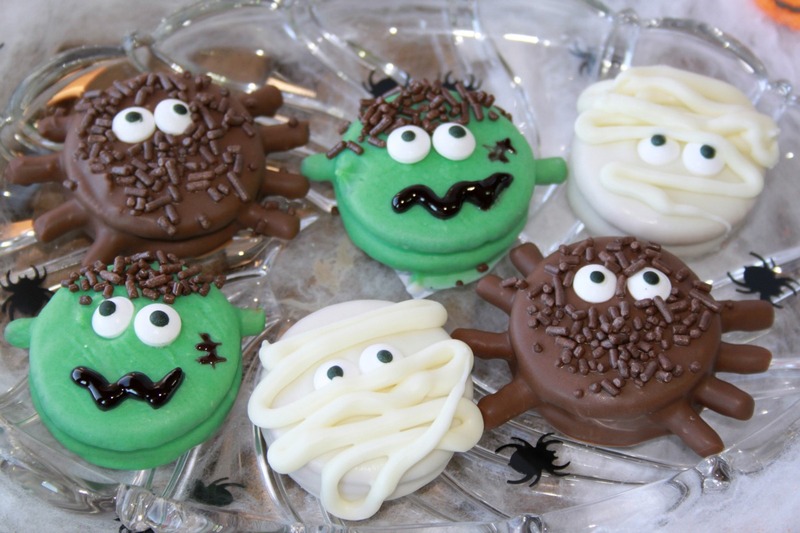 It all starts around my birthday on October 8th and after that I am ready for Halloween. I had an exciting birthday, on my birthday I received a tweet on twitter that The View was wanting some information from me for a Buffalo Chicken Mac & Cheese photo I had tagged them in on Twitter. On Friday the view featured my Mac & Cheese photo in their Food Fight Cook-Off. My Mac & Cheese photo was shown on National TV. I was hoping a mention for my blog but all they said was my name (which they pronounced wrong, my name sounds like this 9-na) and that I am from Springfield OH. It was awesome anyway and I was thrilled to be recognized. The photo above is the tweet that The View put on Twitter later Friday night. 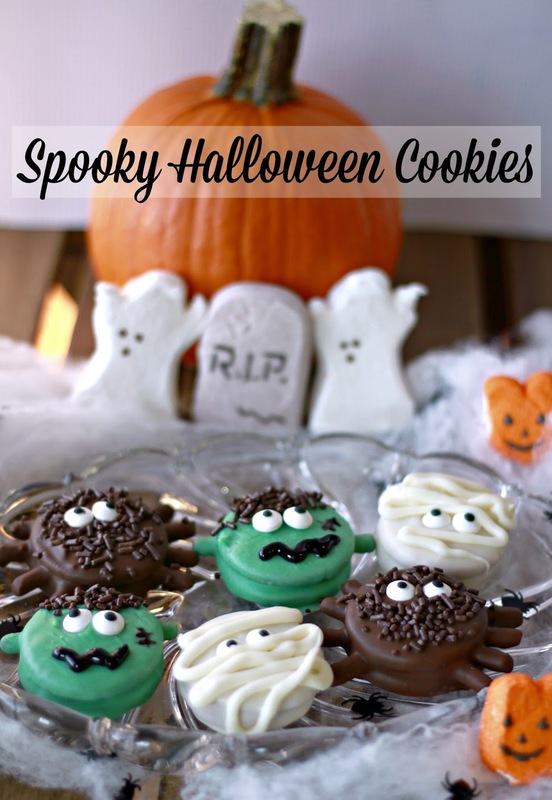 These Spooky Halloween cookies are super easy to make. To start with you do not even have to turn on the oven! They are made with Oreo cookies (or any sandwich cookie). 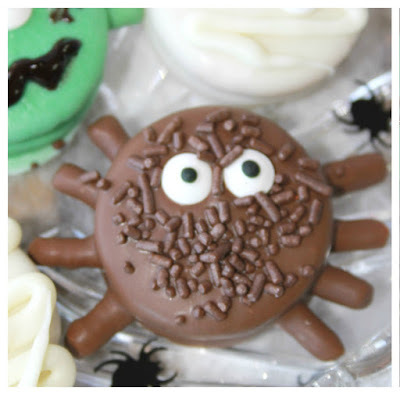 For the spider I used a chocolate Oreo cookie (double stuff), chocolate almond bark, broken pretzel sticks for the legs, candy eye balls and chocolate sprinkles. Before I dipped the cookie in chocolate, I put the broken pretzel stick legs on. I used the double stuff cookies that way there was more room to stick my pretzel stick legs on. Then I dipped the cookie in melted chocolate, add the eyes and sprinkles. 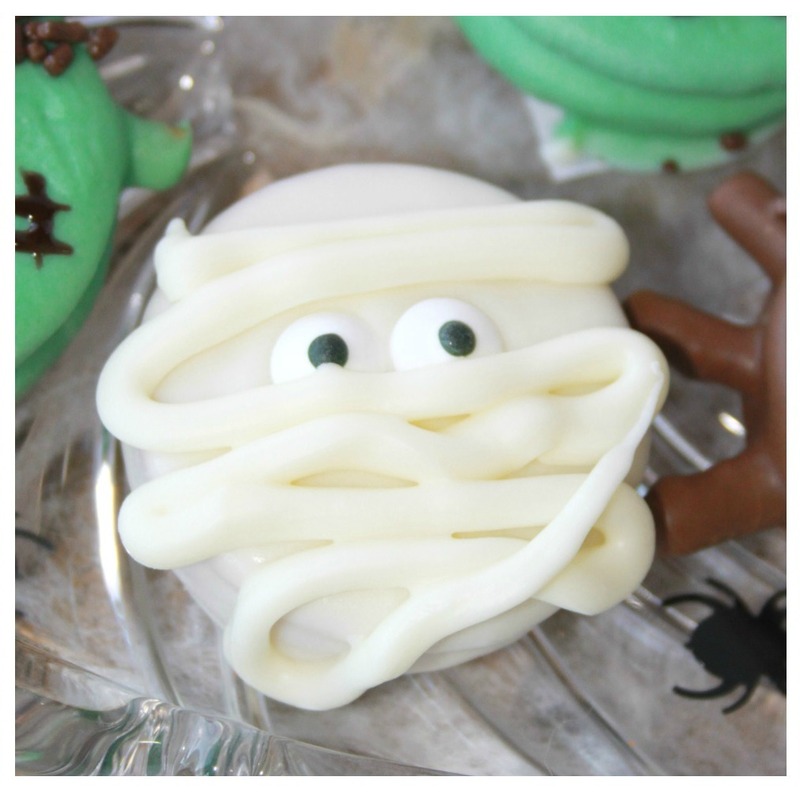 For the mummy I used a pumpkin spice Oreo cookie, white almond bark, and candy eye balls. After dipping the cookie in melted chocolate I placed them in the freezer to set up. 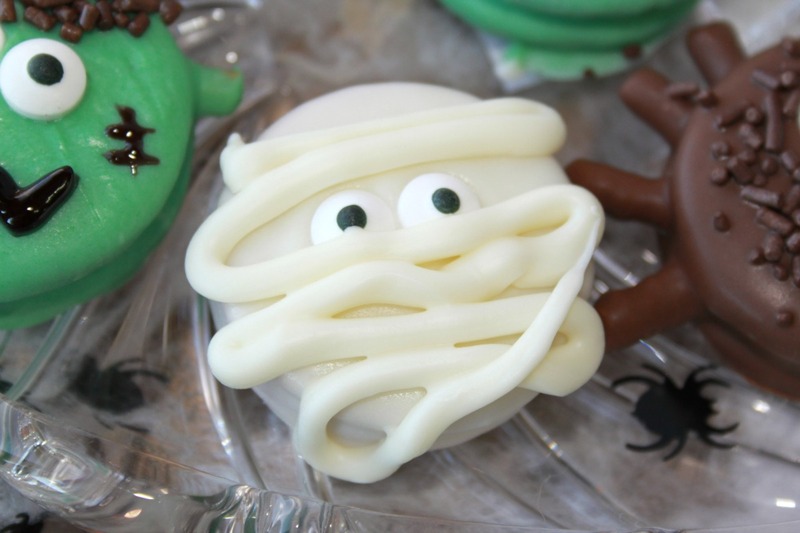 I then let my chocolate cool a little bit so that it was a little firmer to hold its shape when I drizzled it over the cookie for the mummy wrapping. I used a cake decorating bag and snipped off the end. 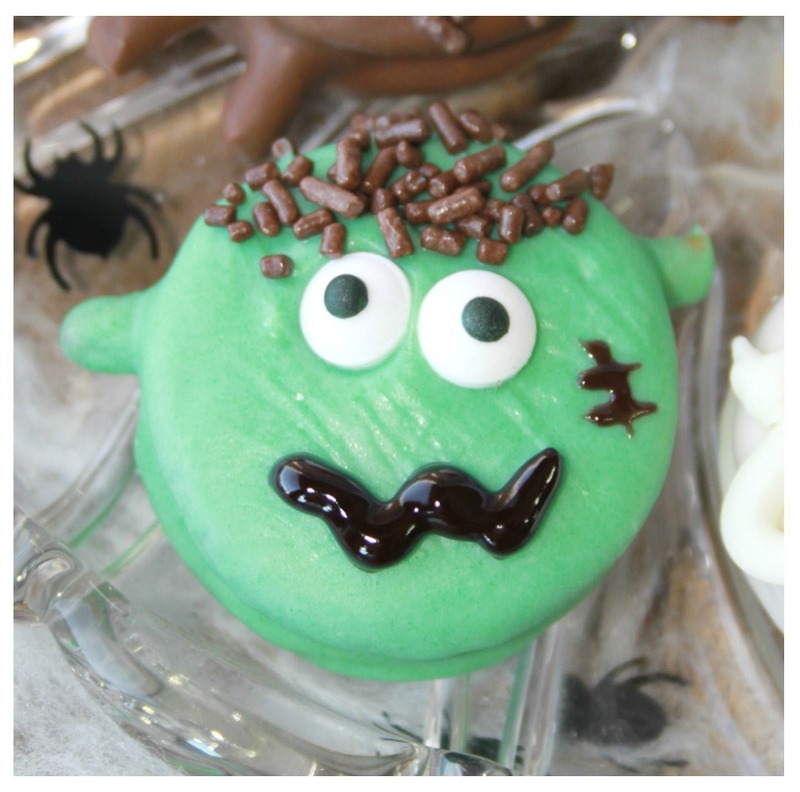 For the Frankenstein cookie I used 1 chocolate Oreo Cookie, White Chocolate Almond Bark, green food coloring for tinting my chocolate green, broken pretzel sticks, candy eye balls, sprinkles and black icing. I again put the pretzel stick on each side of his head on before I covered the cookie in chocolate. Cover Oreo cookies in melted chocolate and then decorate as desired. You could also easily do ghost, cats and pumpkins. These are just too adorable. Love them and pining these. This are amazing!! really loving them! In the United States, pumpkins run as an inseparable unit with the fall occasions of Halloween and Thanksgiving. An orange natural product reaped in October, this nutritious and adaptable plant highlights blossoms, seeds and substance that are palatable and rich in vitamins. in my scan i trust clearly really happy to possess detected your scientific discipline system and look ahead to heaps extra exciting times learning right here. thanks plenty tons everyplace over again in your knowledge.